Another great year in the books, congrats to Deadbeatdad, things didnt look to good when the father of the year went down week 1 against KC, but you withstood. Dont name your team Thanksderek next year. I give SFLABo a lot of credit, made some bold moves, trading Brees, sticking with Cutler, getting LT/TO etc and he was a Philly defense against the most overrated football team of my lifetime in the Cowboys from winning it all. Streetpharm. , I thought for sure you had it wrapped up, but will you please take the VOODOO hex off my team ?! Nothing like a good battle for the "dress" to bring out the best in Smiddy, nobody works a crowded barroom like this man, DCHAMPS you missed quite a show, you'd be happy to wear the dress if you were there. Wizards ? What can I say, until the face of the franchise is out if the slammer, you'll fall on hard times. Good substitute with Cedric the entertainer though. Papa you must have had some serious side bets going on, cause you were spending like one of Smiddy's girls at the Roxie, and I aint talkng the nightclub...I hope you won some of them. Derek, man you must have pissed someone off, your team dropped out of site, kinda like DChamps. JSL , the team with style ! Dont know where I got that, I just like Jeffrey ! I'd like to say a few words about a guy I know, a friend of mine, his name is Brian Westbrook, and he has a heart of a giant, and that rare form of courage, that allows him to kid himself, and his manager, Bill Flaherty. He has the mental attitude which makes me proud to have a friend who spells out 'courage' twenty four hours a day, every day of his life. Now you flatter me, by giving me this award, but I say to you here and now, that Brian Westbrook is the man of courage who should receive the George S. Costanza award. It is mine tonight, it is Brian Westbrook's tomorrow. 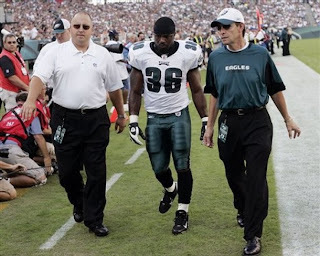 I love Brian Westbrook, and I'd like all of you to love him too. And tonight, when you hit your knees, please ask God to love him"
Please do not let me draft this man again next year, 2 out of 3 years is enough ! Another great year, excellent job as always Derek, great job Deadbeatdad (see no name) you kept it interesting all year. I saw a remake of Brians Song on last week. I tried to watch it but man it was terrible...Viva La Dirtballs! Aint nobody gunna replace Billy Dee & Jimmy Caan, it would be like some group remaking the song Wishing on a star ! Everyone knows Rose Royce did it right !